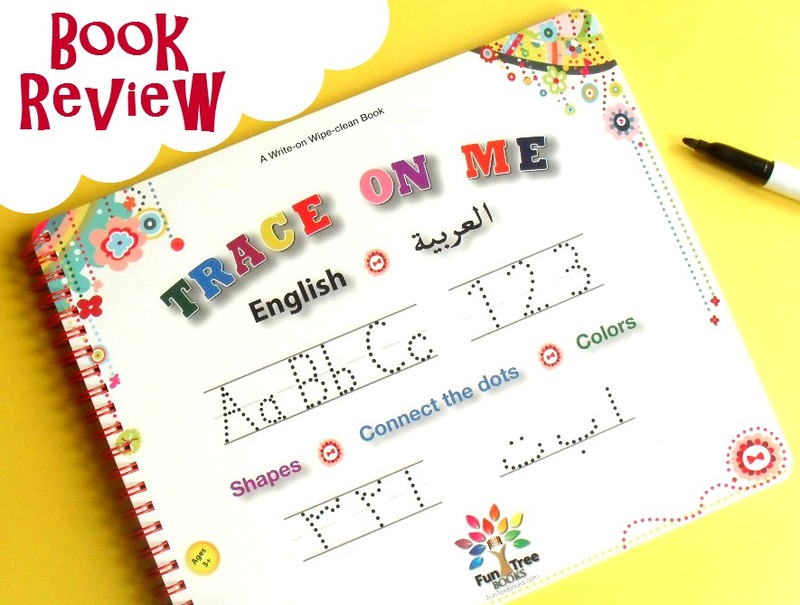 If you are tired of printing off tracing worksheets, and having mounds of paper thrown into the bin, then please allow me to introduce to you this wipe able board book from Fun Tree Books, who kindly offered to send me a copy to review. 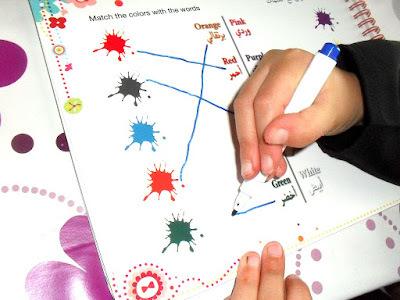 I've seen many of these type of letter tracing workbooks, and initially thought it wouldn't be much different to what I've already come across and used in the past. However (and here is where the famous "but" comes in! ).....I was genuinely surprised when I opened the package shipped all the way from the US! It has been thoughtfully designed and offers a lot more than I had anticipated; including letter tracing for both English and Arabic alphabets, numbers & counting, as well as introducing some basic Arabic vocabulary such as colours and shapes. 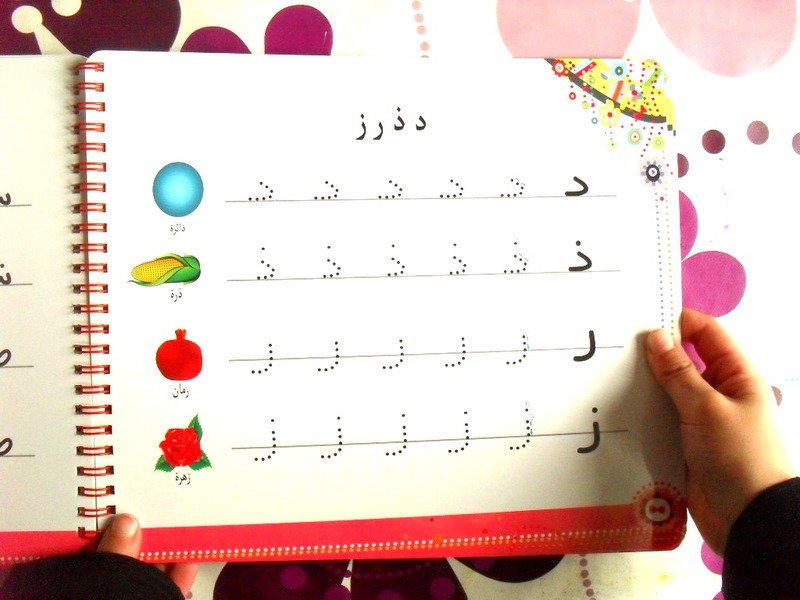 Its made up of 2 distinct sections, the book opening both left and right to give either the English or Arabic activities which focuses mainly on alphabet and number practice in both languages. Each page is beautifully co-ordinated with bright, colourful patterns and non-animate pictures.... it is a huge joy to find a learning book which doesn't contain faces everywhere! I asked my 7 year old to try it out (she is still learning to write in Arabic) and I asked what she thought. Her response was "its nice.....its soooooo nice" as she turned each page, devouring its content. I don't know about you, but I have never seen a child who doesn't enjoy using white board pens! There is something about the way they smoothly glide across the board effortlessly and can be wiped away to start again anew that kids seem to love! This is the kind of activity book that can be used over and over again, siting at the kitchen table or thrown in a bag to take on a car ride. For the young child who is at the very beginning stages of their writing development, this type of work book offers endless opportunity to practice, wipe away and practice again. 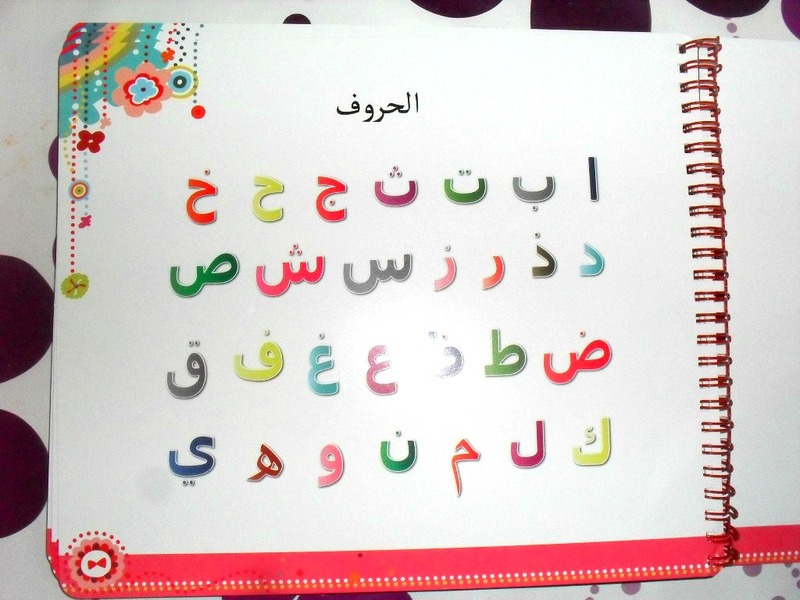 Like I said, even my 7 year old who is just starting to work on her Arabic letter formation enjoyed using this book.....and it means I don't need to keep printing off new worksheets! It truly is a lovely book; I haven't seen anything else similar to this with respect to being bi-lingual with the use of solely inanimate pictures. If you are interested in picking up a copy for yourself, then I have some good news! Jump on over to the Fun Tree Books website, where you can grab a discount code before you purchase! And for those of you on facebook, it would be awesome if you can like their page to help give some support to a Muslim business!